Go karting in Las Vegas was fun. We went to a place called “Las Vegas Mini Grand Prix ”, and they had everything from smaller karts to what they called the Indy Karts which were almost the size of a real car. We decided though to try the usual go-karts with the engine that is the size of a lawn more in the back. The track at this place had was a fair size, and going around the track racing with my wife and sister and laws was a blast. The weather and time of day was perfect for go-kart racing, it had just rained so it wasn’t the usual Las Vegas heat and with the race track dried we had a lot of fun racing each other. Las Vegas Mini Grand Prix is located at 1401 N. Rainbow Blvd. Las Vegas, NV, located on North Rainbow Boulevard near U.S. Highway 95. Their phone number is (702) 259-7000. Part of going on vacation is the outlet mall shopping, and with Las Vegas it was no different, especially with the strong Canadian dollar to the U.S dollar. There were quite a few outlet malls in Las Vegas, but the one we went to was located off the Las Vegas strip and was called “Las Vegas Premium Outlets.” This outlet mall offers 435,000 square feet of shopping in an upscale, outdoor village setting, very similar to the outlet malls of California. Needless to say, my wife and sister-in-laws really enjoyed shopping here. There were quite a few deals if you look carefully. Las Vegas Premium Outlets address is 875 S. Grand Central Parkway, Las Vegas, NV 89106 and the phone number is (702) 474-7500. To get there from Interstate 15, exit Charleston Blvd. west to Grand Central Parkway. One attraction that I think everyone who go to Las Vegas should see is the Freemont Experience. The Freemont Experience is basically “old Las Vegas” or the old Las Vegas strip area north of what is now the new Las Vegas strip area. I don’t recommend going in the day time because all the lights of the casinos and hotels will not be on, however do go in the afternoon if you are looking for a fairly good buffet lunch at a reasonable price, as anywhere on the new Las Vegas strip the buffets are more expensive. 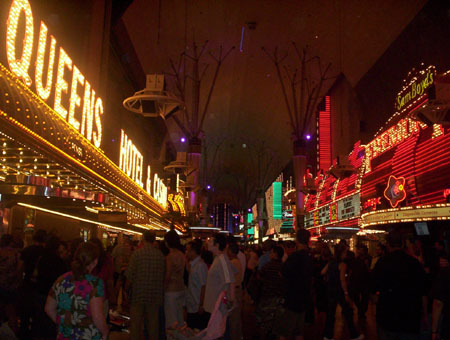 When you go out at night and walk the old Las Vegas strip, you will see all the casinos with their lights on and all along the strip there are 50 cent Margaritas that you can buy and drink and also all sorts of vendor stands selling everything from clothes, paintings and souvenirs. 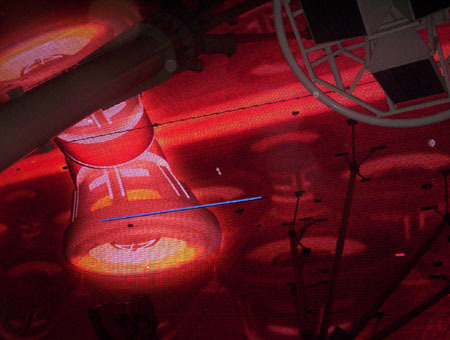 If you look directly overhead above you will see that the roof of the Freemont strip is in actuality a large television screen. Every half hour or hour a short music video would play (see pictures). I really enjoyed the experience, the Freemont area is where Las Vegas started and where historic celebrities like Dean Martin, Frank Sanatra and Sammy Davis Junior hung out. 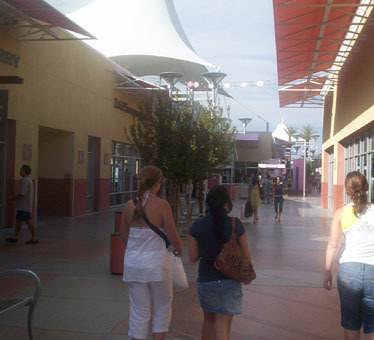 The Freemont experience is located in downtown Vegas, near the Plaza hotel-casino. 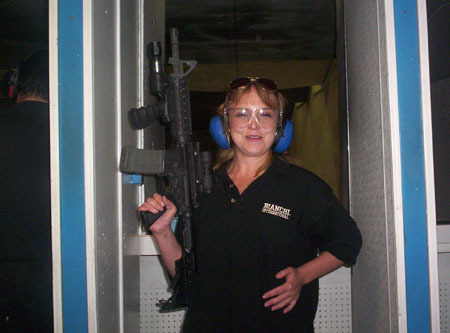 One of my favorite part of our Las Vegas strip was going to the gun shooting range. 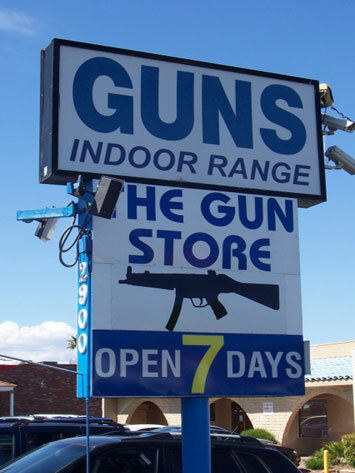 The particular gun range we went to was an indoor target range and it was called simply “The Gun Store.” It is conveniently located on Tropicana Avenue just 3.5 miles west of Las Vegas Blvd. When you go into The Gun Store they first make you fill out a waiver, so they are not liable if you or another patron hurts you with a gun . Next the instructors would take into the range and put up your paper target and proceed to instruct you on how to shoot the gun that you have chosen. I would have to say that the instructors are very professional and patient. They taught my wife how to shoot a 9mm Glock and my sister-in-law an M-16 machine gun, you read correctly an M-16 machine gun. I couldn’t believe my sister-in-law she walked in and points at the machine gun, and said ” I always wanted to shoot a machine gun.” She was shaking as she pulled the trigger on that machine gun, but overall she did alright. As for me I shot a 40 calibre Glock, it was a rush. Don’t get me wrong, I’m not a gun junkie, this is just something that most Canadians don’t do much. Basically it was something to try out just for the experience of it. I will never own a gun as there is really no need for it in Toronto, generally Canadian cities are quite safe. This entry was posted on Wednesday, October 17th, 2007 at 12:40 pm	and is filed under Travel and Leisure. You can follow any responses to this entry through the RSS 2.0 feed. Both comments and pings are currently closed. I thought that was extremeley fascinating. Thanks for that unusual info. I’ll retain pursuing this…. Ha! I love travel and leisure…. Hello and many thanks for this excellent write-up. I am usually trying to find travel suggestions to recommend to my own visitors. It’s precisely what I was looking out for….